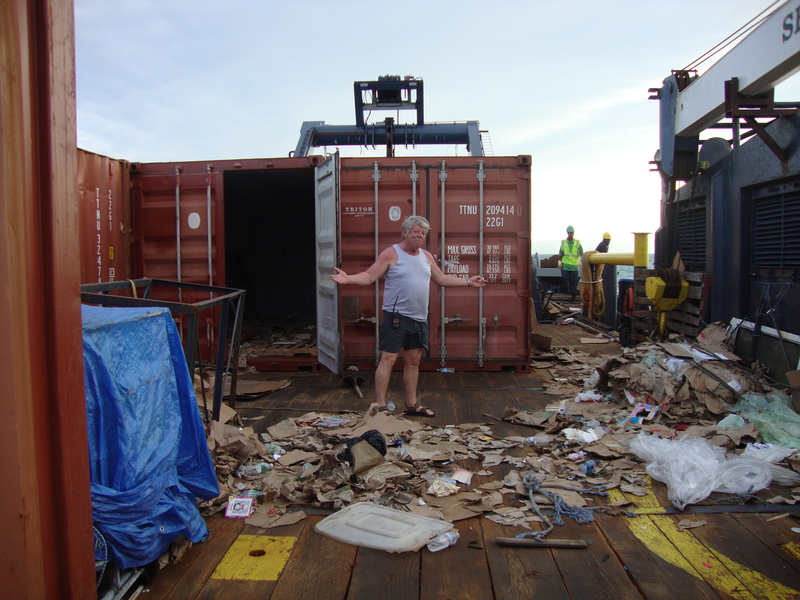 Once all the ten containers were taken ashore to Les Caye, we went about cleaning the deck of the M/V Sea Hunter. There were mounds of trash left behind and we were ready to get our “home” back to normal. With everyone chipping in, it didn’t take long. Everyone was happy and relieved that we had finally finished what we had set out to do. With all the obstacles and naysayers along the way, there definitely was reason to give up or quit, however that wasn’t something any of us even considered. There were times we thought we might get shut down, but with some outside help from some wonderful people and Greg’s strong determination, we made it happen. This would be something we would remember for the rest of our lives. In some small way, we had helped our fellow man. 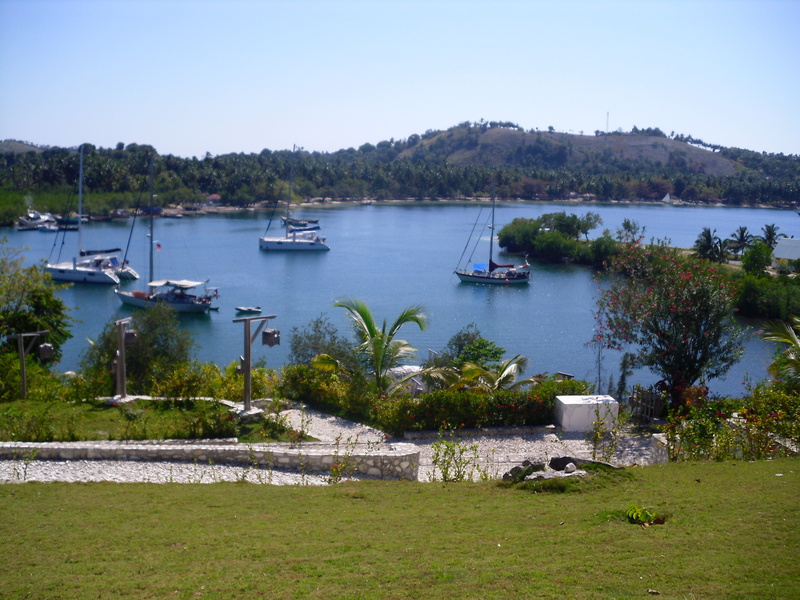 A couple nights prior to that, when the days offloading had ended and the small Haitian boats had gone home, we found ourselves, once again, sitting on the back deck. Greg surprised us with some ice cold beer. He had one of his Haitian friends pick up some Heineken, Budweiser, and of course Prestige (Haitian beer). I must admit, I liked it over the other two. He knew we had all been working hard and he wanted us to have some fun and let loose for a while. The night was warm as we sat around the deck reminiscing about the trip and laughing at our many struggles and stories. The music was blaring our favorite tunes as some of us sang along. It was a wonderful feeling to just cut up with my fellow crew mates. 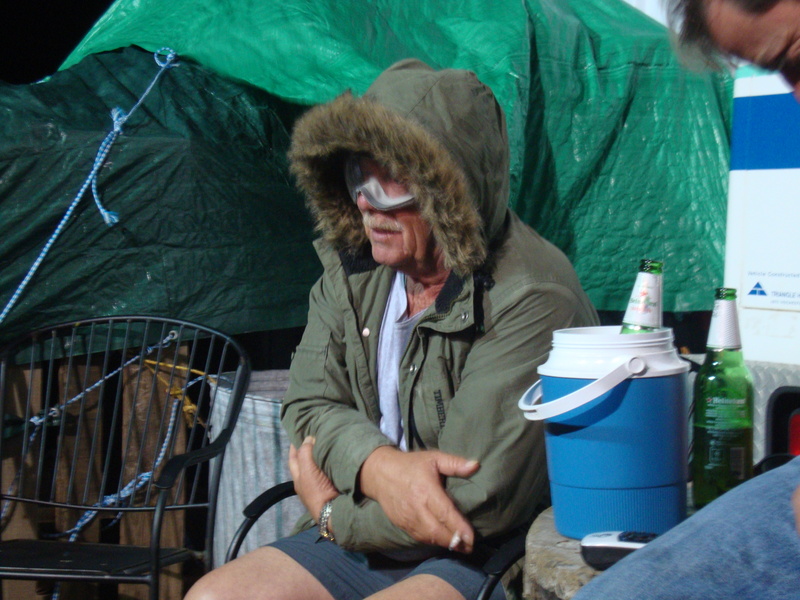 All of a sudden Greg walks out from the galley wearing a green parka with a fur collar pulled up over his head. We immediately cracked up as he looked ridiculous! He said he was freezing and that was all he could find. It was so funny that some of us decided to “dress up” too. With all the hundreds of boxes being moved around some of the clothes had fallen out. We would throw the loose clothing in a pile which had grown over the past week. Nick came out first in a black and white striped halter dress, with Gary next in a silky blue woman’s blouse. Julia and I dug through the pile and found some oversized shirts. A couple of our Haitian friends were hanging out with us and enjoying the antics of the crew. We couldn’t convince them to dress up but they were in hysterics watching us be silly. We would parade around and do a dance and sing a song. Unfortunately there wasn’t one bit of talent in any of us, but that didn’t stop us in the least. With each song that played, Alex would change the words to his own made up version. This too was a riot. We sang and drank till the wee hours of the night. It was just what we needed, and I can say that it was my favorite night in Haiti. Now that all the aid had been delivered it was time to head home. Greg had business to take care of back in Maine so he wasn’t able to steam back with the rest of us on the ship. Bill Nemitz (reporter) and Dan Kidd (volunteer) decided to go back with him as they too had things to take care of. They had to find a ride to Port au Prince and then fly home. No easy task in post-earthquake Haiti. The rest of us decided to take one last day to go ashore for some much needed rest and relaxation. Right off the southwest peninsula of Les Caye is a small Caribbean island named IIe a Vache. If you looked in the dictionary under “small secluded paradise island,” you would find a picture of IIe a Vache. The island is only eight miles long and two miles wide with a total of 20 square miles, but it is pure beauty! My four hours on that beautiful island was just what I needed to wind down from our long trip. It was so beyond peaceful. As we walked to one of only two exclusive resorts on the island, I couldn’t help but wonder what it would be like to live there. I climbed some winding stone stairs that led to an open bar that offered you a panoramic view of the most crystal clear blue waters you could ever imagine. As I sipped on a cold beer and talked with the owner and a few other patrons, all the problems and obstacles we encounter over the past month, slowly slipped away.